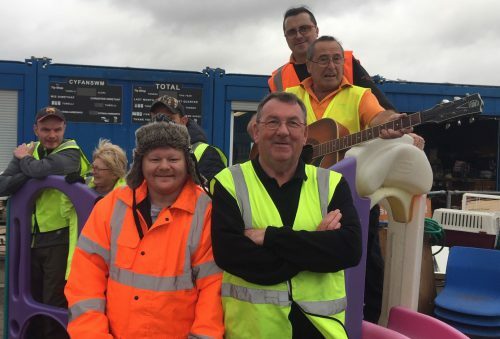 Newport Tip Shop enjoys bumper harvest! Newport Tip Shop recorded its highest ever October “saves” figures last month. The latest data show that 21.3 tonnes of household items were saved from going into the skips on Docks Way last month. That’s a 25% increase over the same period last year. The Tip Shop recorded 9,683 individual items passing through in October, anything from large play houses to musical instruments to ski boots. 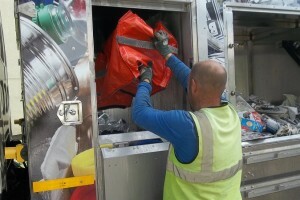 Since April this year they have diverted 50,212 items weighing more than 140 tonnes from landfill. From left: Cookie (volunteer); Vicky (volunteer) ; Jo (volunteer); John Williams (assistant manager); Philip Davies (retail manager); Mike Evans (shop assistant). Philip Davis, our Retail Manager, is based at the Tip Shop. “We’ve seen an amazing growth rate, but it’s not just about the tonnages. It’s just as much about the work of the volunteers. “I’m always amazed to see how our volunteers transform when they’ve been here a while” he continued. The Tip Shop is open seven days a week 9am till 4pm.